The Department of civil engineering was started in the year 2003. 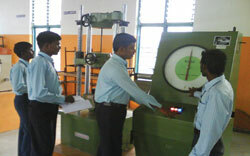 Civil Engineering department is the basic and very essential one for all fields. A country's socioeconomic development mainly depends on the infrastructure facilities like roads and railway network, water supply, effective drainage, irrigation and river water management etc., Civil engineering field covers all these parameters. The following elective subjects are chosen for the benefit of the students. Our students attained cent percent result in many subjects. Finally we are preparing the students to be not only best in their academic pursuit but also employable in any of the Civil engineering fields.